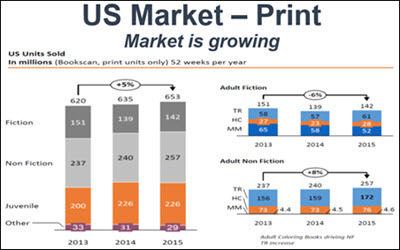 To paraphrase Mark Twain, reports of print books’ death have been greatly exaggerated. 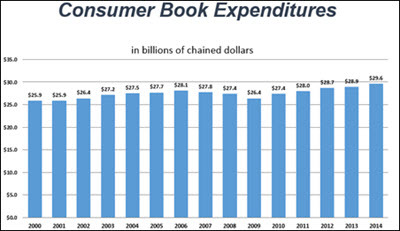 But in reality, aside from a sales dip during the recession in 2008 and 2009, book sales have been very stable, showing slight growth each year, Cox said. That’s a stark contrast to the music industry’s transition to digital, which saw sales plummet from $21 billion to $8 billion between 1999 and 2010, he noted. E-books’ market share grew from 0.5% in 2007 to 21.8% in 2013 (with most of that growth during 2009 to 2012), but has now plateaued, even declining a bit, to 22%, as of 2014, according to AAP data. That parallels a decline in sales of e-book readers and desktops and laptops, and rises in smartphones and tablets. Print book unit sales rose 5% between 2013 and 2015, with increases in the fiction, nonfiction and juvenile subcategories. Adult nonfiction gains, recently driven by adult coloring books, have offset declines in adult fiction that reflect no current replacement for the “Fifty Shades of Grey” phenomenon. Last year, a Wall Street Journal article observed that “print books have proved durable because, as a format, they are hard to improve on.” Indeed, print books share readability and portability with e-books, but also boast a long list of utilitarian benefits digital cannot, including “shareability,” tactile and visual experience, and their role for some as “show pieces” that reflect their personal identities and values, Cox said. Book reading is stable among American adults. And contrary to common assumptions, younger adults—those 18 to 29—are most likely to have read a book in the past year. Eighty percent have read at least one book in the past year, and 70% have read a print book. While social media are an effective platform for promoting to targeted audiences, print books remain critical to the discovery that drives sales. Browsing displays in physical stores remains the most common way to discover specific book titles. In a 2015 Nielsen survey, 16% of book consumers reported seeking out new books in stores. The next-most-used book discovery channels were TV ads and in-person recommendations from friends or relatives, each cited by 5%.